Economics Minister challenges world critics: do you want to do the job for us in Gaza? Names Qatar as leading sponsor of Islamic terrorism. Economics Minister Naftali Bennett has called on the football's international governing body, FIFA, to cancel its decision to hold the World Cup in the gulf state of Qatar, due to the country's support for Islamist terrorists, including Hamas. Speaking to Sky News, the Jewish Home party leader rejected suggestions that Israel is responsible for civilian deaths in Gaza, repeating his position that "cowardly" terrorist groups who embed their forces among civilians and use the population as human shields are to blame for any subsequent deaths. 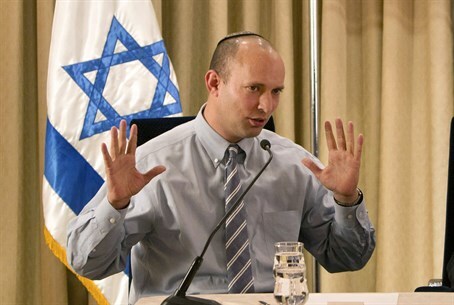 When the interviewer accepted that Israel did indeed have a right to defend itself, but continued to ask how Israel could "justifiably" continue its military operation in Gaza given the civilian casualties, Bennett challenged his interviewer to "imagine if on London you had about 200 rockets falling a day - a day! - from a ...radical terror group. So are you effectively saying that you have the theoretical right to defend yourselves but practically you can't do anything?" "We have to stop this," he agreed, but noted that the way to do so was not to pressure Israel but to cut off funding to radical Islamist groups who are responsible for regional instability and unrest. "If we want this to stop we have to stop the funding," Bennett said, and went on to assert that "the biggest funder of radical Islam(ic) terror is Qatar." "We have to get Qatar to stop funding Hamas, Al Qaeda, Al Nusra and ISIS with money." The tiny gulf state has been using its oil wealth to punch above its weight, vying with regional powers such as Saudi Arabia and Iran for influence in the Middle East by funding a range of insurgent and terrorist groups in Syria. Among other things, Qatar is the leading supporter of the Muslim Brotherhood, whose Palestinian branch is Hamas. Bennett asked why a state which sponsors terrorist groups is being allowed to host the prestigious World Cup games in 2022, and suggested the international community condition that on an end to terror funding. "We have to call on FIFA (to) cancel that: don't allow them to hold the World Cup because this is a terror state who's funding most of the world terror. If we stop the money terror stops and this whole thing stops." Bennett went on to challenge Israel's international critics head-on, by pointing out that Israel had accepted international demands by totally ceding the Gaza Strip in 2005. "We handed them the land and they turned it into a fortress of terror." "We have too dismantle the fortress - unless your're willing to do the job. I'd love that to happen," he quipped.